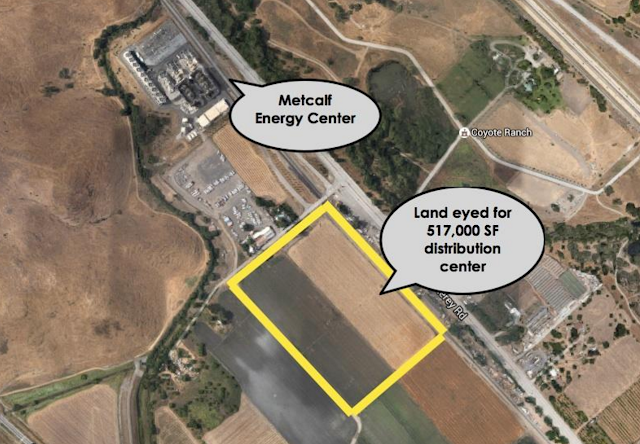 There have not been talks of major development in the Coyote Valley region since plans for Cisco's new 6.6 million SQFT headquarters fell through in the early 2000s. That will soon change, but the development is not what you would expect. The Panattoni Development Company has submitted an application for a 517,000 SQFT warehouse and distribution center. The building would have 36-foot-tall "clear heights" and a high-tech sprinkler system, making it very attractive to companies like Amazon. E-commerce companies are scrambling to build distribution and logistics centers to keep up with demand. Over six million SQFT of industrial buildings in the Bay Area have been repurposed for commercial, residential, or some other use. Only three million SQFT of new industrial space has been built to replace what was taken away. That leaves high demand for industrial space with limited areas that allow for industrial development. The proposed project is only 20 miles away from the bulk of the Bay Area's population and is conveniently a reverse commute. Panattoni plans to develop it speculatively, meaning they are willing to construct it even without a signed tenant. If the stars align, they could start construction this September. This won't be the only new industrial project in the area. Panattoni is also building a new warehouse for DBI Beverage just a few miles north along with another 111,000 SQFT warehouse that is not yet leased.